FORUM OF AFRICAN WOMEN EDUCATIONALISTS (FAWE) for 200 needy girls (all 3 levels) in Monrovia. ASSISTING DISADVANTAGED WOMEN & GIRLS (ADWANGA) for 100 needy girls (primary and secondary levels) in Nimba County. RESTORATION OF EDUCATIONAL ADVANCEMENT PROGRAM (REAP) for 100 needy girls and young women (primary and secondary levels) in Montserrado, Cape Mount and Margibi Counties. MEASUAGOON for 100 needy girls (primary, junior and senior high levels) in Montserrado County. LIBERIAN CHILDREN SCHOOL PROJECT (LCSP) for 50 parentless girls in Gbarnga, Bong County. Half are in primary and half in secondary school. NB: grant covers uniforms, books, registration cards, copybooks, etc. COMMUNITY HEALTH & DEVELOPMENT AGENCY (COHDA) for 100 needy girls in primary (40), Junior High School (35) and Senior High School (25) in Voinjama, Lofa County. SMILE AFRICA INTERNATIONAL (SMILE) for 50 destitute war-affected women and girls in Jonquellie District, Bong County (half in primary school and half in Junior High School). ZOE MEMORIAL HUMANITARIAN PROJECT (ZMHP) for 50 needy girls (half in primary and half in secondary school) in Lower Buchanan, Grand Bassa County. RURAL MISSION BUILDERS (RMB) for 50 girls (half primary and half secondary) in the Kayah Chiefdom of Rivercess County. NB: This remote county has one of the highest illiteracy rates in Liberia. 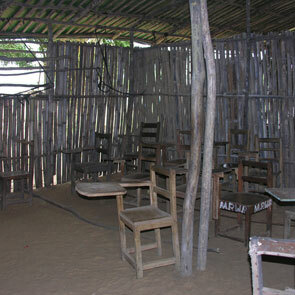 Most girls are sent to “bush school” rather than to formal education. HELPING HAND LIBERIA (HHL) for 50 war-affected girls in 4 districts of Nimba County; half in primary school and half in secondary school. NB: the war began in Nimba; many girls were recruited to fight. MUAMMAR GADHAFI ARABIC and ENGLISH INSTITUTE (MGAEI) for 50 Muslim girls who are dropouts (Junior and Senior High School level) in Duala, Bushrod Islands. BUCHANAN CHILD COMMUNITY BASED CARE ( BUCCOBAC) for 50 teenage mothers/dropouts and girls (primary and secondary levels) in Buchanan and environs, Grand Bassa County. WILLIAM V.S. TUBMAN TEACHERS COLLEGE, UNIVERSITY of LIBERIA for 100 women in the teaching degree program for primary and secondary school. ASSISTING DISADVANTAGED WOMEN & GIRLS (ADWANGA) to enroll 50 women ages 18-40 in Tappita, Nimba County. COMMUNITY EMPOWERMENT PROGRAM to enroll 100 women and girls in Paynesville, Montserrado County. LIBERIAN WOMEN INITIATIVE to enroll 100 women and girls in the 72nd Community, Paynesville and in Duala, Montserrado County. MAA KUANSON LITERACY SCHOOL to enroll 100 women between the ages of 15 and 65 in 8 communities in Gbarnga, Bong County. MANO RIVER WOMEN PEACE NETWORK to enroll 100 women in Montserrado County. PURPOSE FOUNDATION to enroll 100 women and girls ages 18-35 in Barnersville, Montserrado County. RESTORATION OF EDUCATION ADVANCE,MENT PROGRAM (REAP) to enroll 50 women and girls in Elwa and Red Light Junctions and Schefflin and Bentol villages and towns in Montserrado and Margibi Counties. SAMPSON SAYWON BOAH INSTITUTE to enroll 100 women in Gardnerville, Montserrado County. SEAN DEVEREAUX CHILD EDUCATION PROGRAM to enroll a 100 women. in Brewerville, Virginia, and Grand Cape Mount. SOUTHEASTERN WOMEN DEVELOPMENTASSOCIATION (SEWODA) to enroll 200 women in Maryland, Grand Gedeh, River Gee, Grand Kru counties. WOMEN AID INCORPORATED to enroll 100 women and girls in Karweken City, River Gee County. WOMEN DEVELOPMENTASSOCIATION OF LIBERIA to enroll 100 women in Brewerville, Montserrado County. LIBERIAN AGENCY FOR COMMUNITY EMPOWERMENT (LACE) to construct and rehabilitate, furnish and provide with basic instructional material 18 schools principally in the rural southeast counties. LIBERIAN LANGUAGE AND LITERACY ORGANIZATION (LIBTRALO) to support the participation of 75 local language association stakeholders and other experts in a ten day workshop sponsored by the Ministry of Education entitled “Curriculum Development for Liberian Languages and English Multilingual Education” to develop mother tongue curricula for K1 and K2 in 16 local languages. WEBBO RURAL TEACHER TRAINING INSTITUTE (WEBBO) to support a training workshop for 100 untrained primary school teachers from the SE region in a range of basic subjects. V. LIBERIAN EDUCATION TRUST-MONROVIA GRANTS TOTALING $45,690 to establish itself on the ground as a partner organization to LET to help develop and oversee the implementation of our strategy; to receive and vet proposals; to monitor and evaluate grants and programs; and to convene other education donors and providers. LET has made grants totaling some $5 million dollars from 2006-2011. For further information on the grants made, please contact LET at infolet@comcast.net. LET is a grant making initiative. It makes grants only to Liberian NGOs and organizations. LET works closely with its locally registered Liberian partner organization LET-Monrovia (LET-M). Proposals are first reviewed by the LET-Monrovia staff and then approved by the board. An MOU is issued to successful organizations. The MOU must be signed and returned before any funds are transmitted to the grantee.